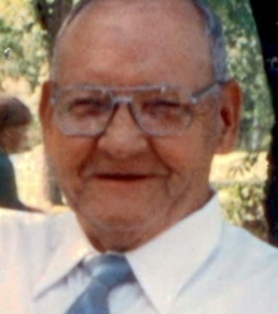 Lloyd L. Janes, of El Dorado Springs, Missouri, was born February 12, 1923, and died November 30, 2011. He was 88 years, 9 months, and 18 days old. At the ripe old age of 20, he served in the United States Army, from February 23, 1943, to November 10, 1945. He was assigned to the 1878th Engineering Company B, where he was a truck driver. He was stationed in the Philippines and the Mariana Islands of the Western Pacific Theater. He was awarded two bronze stars, a good conduct medal, a Pacific Theater campaign ribbon, a victory ribbon, and three overseas bars. In the spring of 1946, he married Glendine Stires, a widowed mother with three sons, James, Joe, and Lonnie, which he adopted. He set out making additions to the family. Glen Lee was added in October of 1946, Edgar L. came in June of 1952, and not wasting any time they had Nancy 10 months and 27 days later; with Nancy he finally had his girl. Glendine passed away in September of 1991. This union produced 6 children, 29 grandchildren, 66 great-grandchildren, and 42 great-great-grandchildren. He married Naomi Lane in June of 1992. He was 69 years old. They had 18 wonderful years together until she passed in March of 2010. Two of his sons, Joseph Oakley and Glen Lee, also preceded him in death. Besides making a family, he drove trucks, and became an accomplished auto and farm equipment mechanic. He loved to fish and hunt. He was a little league coach for six years and always loved kids. Lloyd was a father to six of us, a grandpa to a bunch of us, and a friend to more than can be counted. He touched many with his wit and charm. There was not much he could not fix except himself at the end. He found the Lord and has moved to a better place. The last few weeks I have been reminded of many moments of his life. He took me deer hunting when I was 12. I threw my rifle on his coat that lay in the front seat of an old car he drove. I never knew he had a bottle of peach brandy in the pocket of his coat. My rifle broke the bottle and that old car smelled like peach brandy for years. I will miss him but I am proud to have been his son. Funeral services for Lloyd Janes were held on Saturday, December 3, 2011, at 2:00 p.m. at Bland-Hackleman Funeral Home with Kenneth McIntosh officiating. Emma Eason and Ron Hubbard provided music. Interment followed in Clintonville Cemetery under the direction of Bland-Hackleman Funeral Home. Pallbearers were Edgar Janes, Mark Janes, Cody Janes, Butch Janes, Jeff Janes, Brandon Jennings, Brian Eason, and Paul Ivanoff.